I felt like posting something, so here...something happy in the wake of Evie's ER drama. It's funny, but my current obsession with the television show "ER" really did pay off Friday, since I was well aware of everything that was being said and done! It was nice not to be in the dark about things. 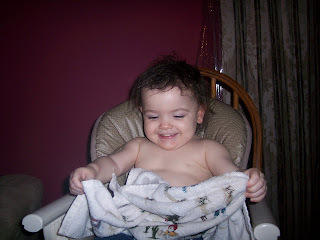 Lily after we "washed" her hair with a rag. She had all kinds of oatmeal mess in that hair. I had to strip her down, there was so much on her! 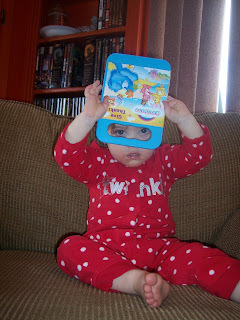 Evie peering through a DVD case she got for Christmas. 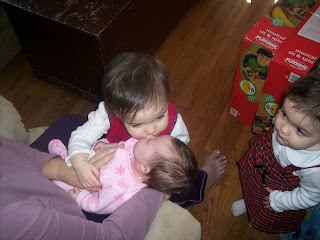 Evie giving Maddie a kiss at Christmas. Cute pics! They're getting so big! 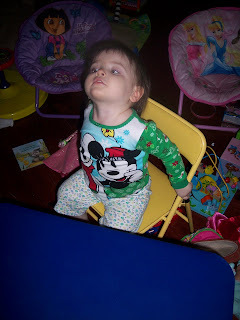 I'm glad Evie is doing better. I watch "Mystery Diagnosis" and other shows like it on Discovery Channel and it annoys my husband because he's the type who is overly superstitious and thinks if you see or talk about bad things they'll happen to you. But, I love the shows and think they help you understand more about your health and about illnesses. They're great shows.